The Columbia College volleyball intramurals wrapped up on Nov. 5 with the final day of games at Southwell Gymnasium. The PIE Spikers led by Faye Burchard, dean for Campus Life, won the championship game against the Mad Dogs. Eight teams participated in the recreational division and six in the competitive division. Elisha Sanders, sophomore member of the champion team the PIE Spikers, said that she enjoyed the league but wished it were longer. “I’d love a longer season,” she said. “I would say a couple more weeks would be good.” Freshman Jill Pritchard complained that the rules of the game were not clear. “I didn’t know we could hit the ball with our heads and feet until the fourth game,” she said. 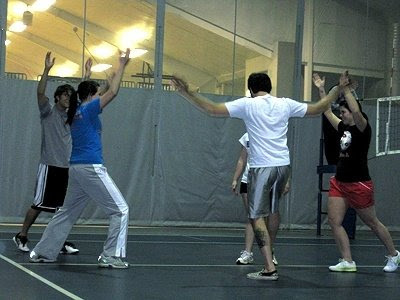 The volleyball league started just after the end of intramural softball, which consisted of one league of seven teams. The softball league was not completed as rain prevented the teams from starting the semi-final round for several weeks. Because of rules limiting only one intramural session at a time, the softball league was forced to terminate without a winner when volleyball started. “I hope we get to finish it out in the spring,” said Kyle Storm, senior, of the Storminators. He added that he was not sure that was possible because the Columbia College softball team will be in play during that time. 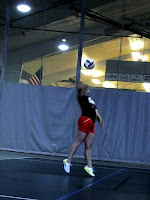 Junior Jillian Rathert of Zee Jobs serves the ball during intramural volleyball. Photo by Ran Kim. Juniors Chris Hawkins, Jennifer Mantler, Nick McCarty and Jillian Rathert of Zee Jobs get pumped up for their next match. Photo by Ran Kim. As a graduate of Columbia College I was disappointed to hear that softball was canceled. It was my favorite intramural activity. Oh well go Degrassi!! !